Is there any plausible reason for a robot's eyes to glow? Many sci-fi machines and robots have glowing eyes, though there's no apparent reason why any such thing should be the case. One possible example is something like a cat's eye, where light is sometimes reflected in the dark but that seems unlikely for a digital camera. Is there any plausible explanation as to why a future robot's eyes might glow? 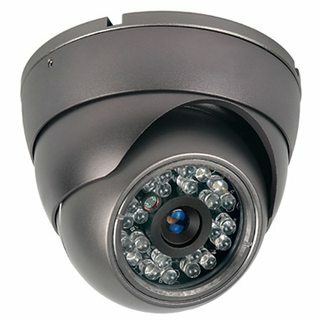 The idea is that most IR cameras are not as sensitive as the human eye, so they need extra illumination to see anything. Putting the IR illumination right next to the camera proves to be very effective -- there are no shadows in the scene when you do this, so there's nowhere to hide. This is practical in the IR spectrum but not the visible spectrum because humans would be very bothered by a bunch of white LEDs lighting up the scene from a camera. However, since they can't see infrared, they don't mind a whole ton of IR illumination coming down. 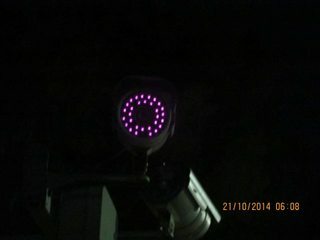 In practice, some of the light from the IR leds is visible as a dull red glow, which shows up pink when photographed due to the way digital cameras process their images. But the screen can really display anything, including eyes that, because it's a screen, glow. The reason why the robot would display eyes is another question, but answers include: human-robot relations, appearing less threatening and artificial intelligence. My webcam has a light, as to most video camers to indicate they are recording (or where to look while being recorded). So the reason is a social convention or legal requirement: a tally lamp to indicate that a machine is in fact looking at you, and an indication of how to make “eye contact” because people are uneasy without that. If by "eyes" you mean the cameras or whatever sensors it uses to perceive the world visually, no. This is usually done in media for no better reason than because it looks cool. At first glance it seems like the head lights are its eyes. Look again. 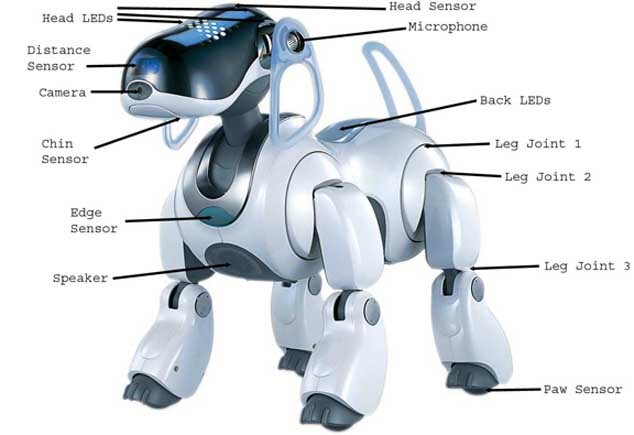 A robot could have glowing "eyes" so that a human talking to it will maintain proper eye contact, for whatever reasons the bot's designer had in mind — in AIBO's case it can use its LEDs to communicate. Or they may work as flashlights (for humans, not for the robot) so that one can see which direction the bot is looking at even if they are behind the bot. Or they could serve as an indicator that the bot has your attention, or if it is turned on (i.e. : if the eyes are off, the robot is off or in stand-by). Last but not least — the robot may be secretly communicating using a protocol similar to morse code‡. They are blinking their eyes too fast for us to see. Think about it, a fluorescent light "blinks" 60 times per second and we can't see it. The robots have been telling jokes about us humans all this time right under our noses, next thing they are going to break the first law and kill us all. ‡ Yeah, they could use radio to discuss their plans via bluetooth or wifi, but they knew we'd be snooping that kind of communication. Reason #1: Because it's scary. If the robots are built with the intention of being intimidating or frightening, then they will be designed with scary-looking features. Glowing red eyes are great for that, especially if combined with other evil-looking facial attributes. They'll probably also have bulges to make them look muscular, random unnecessary spiky bits, lots of dark coloured brushed metal, and other industrial design cues. Welcome to the future! Muahahaha! 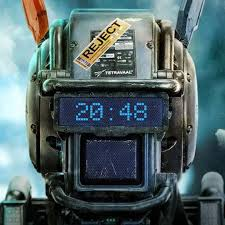 In the novel Robopocalypse (which is really just World War Z with robots instead of zombies) robots have "intention lights" which glow specific colours to communicate to people whether they understand the instruction, operational status, etc. These are simple non-humanoid bots with basic personalities, but as I recall the more advanced bots with "faces" retained this legacy feature. Your bots might have something similar, coded lights that communicate the equivalent of facial expression or status to people around them. The eyeshine of certain vertebrates was an evolutionary side-effect, because these animals evolved in an environment where artificial lighting was not available at night. Therefore eyeshine cannot be compared to the glowing eyes of robots. (This side-effect must have saved countless humans who were fortunate enough to gather around a fire). However, there's a perfectly valid reason to have glowing eyes for humanoid robots, or robots who interact vocally with humans and have a face. Humans would be far more comfortable talking to a "face" with eyes rather than a globe of light. Human eyes are complex and intricate objects. To project humanness a robot must have eyes, and the eyes should include some complexity in surface detail, shape of the eye, eyeball, iris, and pupil. They also have identified that eyebrows do a large part in making a robot humane. Perhaps not exactly what you have in mind, but this seems to have a rather simple answer if you look at the problem from a different direction. The computer on my desk lights up when I turn it on. As do most other electronics. It’s a very simple way to allow human users to determine at a glance whether something is active. Very simply, one reason why a robot would light up would just be basic UX Design to provide that affordance to humans who interact with them. After all, how embarrassing would it be to stand there telling a robot to do something without realizing that it’s off? That’s like calling IT support because your PC isn’t plugged in. Using the eyes (or at least the position in which a human would have eyes) as this on/off indication would conveniently line up with a general understanding of our own eyes being either open or closed depending on whether we are asleep. 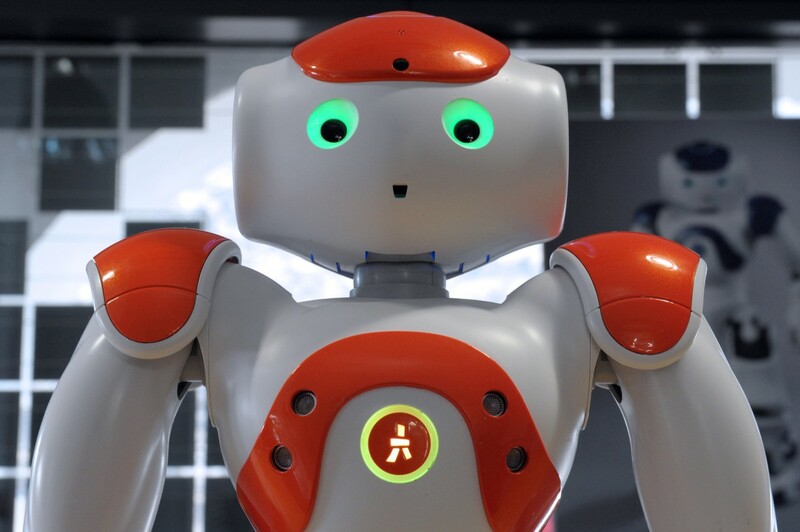 Since most people would look at a humanoid robot's face when attempting to communicate with it, the "eyes" are also very obviously positioned. In short, if your goal is a humanoid robot that interacts with or takes instructions from humans, it honestly just makes sense. Well, "future robots" probably not, but when we revert to steam punk, it's worth noting that a number of historical video camera tubes actually featured a glowing cathode for the emittance of the scanning electron beam. Of course, it would be highly unlikely to see that glow frontally (rather than at best from the side of the tube) since the optical path to the charge plate (sort of like the retina) would not intersect with the cathode for the scanner. Where the "retina" itself is a cathode (like with photomultiplier tubes), it's much more likely to require cooling than heating in order to reduce electron emission not prompted by light. In many cases in sci-fi, eye color serves as a substitute for facial expression - red for angry, blue for cheerful, whatever. If robotic technology is not advanced enough to permit mobile facial features, color-changing eyes might be included as a means of broadcasting emotion. Alternately, it could be a sort of optical echolocation. A common means of mapping is something called an infrared spectrometer, which works by firing infrared at a surface and observing the reflected signal. Now, if for some reason the robot's infrared light source is inefficient, it may produce red light as a byproduct of the infrared. You could have a visible-light laser range sensors in the place of eyes. In addition to dual cameras, they will find the distance in a more sensitive way. The 'eyes' (they are infrared transceivers actually) have glowing LED's around them. Here they glow green, but they can show any color to indicate emotion or status. User interface design, and other interactions with organics wherein knowing where the robot is looking is either psychologically comforting, or conveys useful information (look there!) are also valid reasons. For one very large reason that cars use headlights. To be seen. It is true that headlights allow a car's driver to see in the dark, but they additionally allow the car to be seen from much greater distances and with much greater clarity, even in the dark. In fact, there are strict regulations in the US on what kind of lights and reflectors are required for many types of large vehicles, both for visibility and communication, and boats have standards as well. Your robots could rely on wireless communication for this kind of information--if you wanted them to--but they definitely don't have to. I would imagine any futuristic robots that have wireless communication (you could make retrofuturistic robots that don't have wireless communication) would be constantly pushing the limits of how much data they can send wirelessly, and as such, any data that could be offloaded to simple visual or audio cues, such as location, would be utilized. Lenses tend to have some glare to them. If you have a light source and detector sufficiently close together, you can notice when a camera is pointed at you from the reflection. Many powerful IR/UV emitters also give off some visible light. This begs two questions, however: why the emitter is mounted at the eye, and why they don't bother to filter the visible output. Phones often have a light on them for a flash to illuminate the subjects that they take photos of in the dark. If your robot was designed to collect film for the people who built it, it would make sense to make it illuminate the things it was filming. If it were operated by humans, it would make sense to put the light/cameras where eyes would be on a human so that a human watching the video would see what they would have seen had they been there. also, it would mean they could conduct morse code through blinking! There's even a reason for them to change color before an attack! TOF, time of flight distance measuring, relies on sending out light, and measuring when it bounces back. Smaller wavelength means more precise measurements. For civil situations, the robots use near-VIS UV, so they can spot hairs and dust. The eyes glow faintly blue. When the going gets tough, the robots switch to near-VIS IR, because they now mostly care about center mass calculations and fog penetration (blood fog may occur suddenly...). Their eyes now glow faintly red. The 3d map TOF generates has to be fusioned with pictures in various wavelengths, so the robots also need a nomal camera - presupposing near future tech that camera need not have active illumination to be superior, though. Not the answer you're looking for? 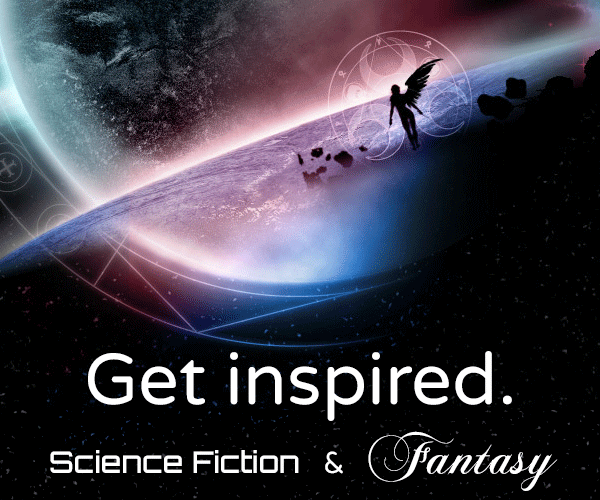 Browse other questions tagged science-fiction robots or ask your own question. Is there psychological reason to design a red eyed creature? Would intelligent life evolve any other body plan than humanoid? Are there any viable communications across light years of space? Is there any feasible real sounding science sci-fi explanation for a chronovisor? Are there any real reasons for interstellar conquest? Are there any structural materials suitable for production underwater? Plausible reason to leave the Solar System? Is there any advantage to have A.I. being able to experience loneliness?